So we have reached the final installment in my 20-day series on great albums. Singing us out is Lyle Lovett and his 1996 album The Road to Ensenada. Lovett’s albums tend to suffer from multiple personality disorder. His influences are so broad and his style so far-reaching that his records often end up as a hodgepodge of great ideas. He dabbles in country, jazz, blues, rock and gospel, making for wonderful songs but schizophrenic albums. The Road to Ensenada avoids that confusion. It’s a straightforward collection of traditional country and honky-tonk and, though it is less expansive than his earlier work, it remains the best thing he has ever done. I don’t mean to imply that this album lacks diversity… hell, it doesn’t lack anything. And the bossa nova story song ‘Her First Mistake’ is proof enough that Lovett is still stretching his musical boundaries. But there is a focus and thematic unity here that gives the album power. I’ve already featured three of this album’s songs on the blog: the haunting title track, the aforementioned ‘Her First Mistake‘ and ‘Fiona,’ a song so good it’s partially responsible for the name of my younger daughter. The Road to Ensenada is the third album in this series to focus on a breakup (in this case, the dissolution of Lovett’s brief marriage to Julia Roberts). Many of the songs touch on that experience, either directly or indirectly. Today’s track is told from the perspective of a man who has been mistreated in the relationship and has gathered the strength to walk away. He wants more than anything for things to be like they once were, but he knows that’s never going to happen. 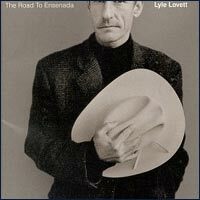 This entry was posted in song of the day and tagged It Ought to Be Easier, Lyle Lovett, The Road to Ensenada. Seriously though, how brilliant and haunting to start off the song with such a simple message. Please convey to your parents that I love them and I tried; I certainly didn’t anticipate that our marriage would come to an end, and I likely won’t have much to say to either of them once we’ve divorced – despite the fact that, for the moment at least, they’re my parents (in-law), and I’m their son (in-law). That refrain – and the most haunting line in the center of the song – “it’s just out of weakness that both of us stay” – make this song just brilliant in my estimation. Oh, and by the way, you’ve only managed to share 30 seconds of the song here. Please embed the whole thing! 🙂 Thanks! Not sure what Amy is talking about regarding the embedding–whole thing is playing for me. Anyway, I agree that this is a very strong album, though I still find Joshua Judges Ruth to be a more compelling work overall. Admittedly, the fact that Joshua tilts more toward gospel influences and away from traditional country probably has much to do with my personal preference. Actually, though I am Mr. Country, I agree with you that the country songs weaken his earlier albums. I think he almost went out of his way to write overtly “country” country songs to contrast the blues and jazz elements. When he blends the country elements in more subtly, that’s when he really has success. Today’s song is a great example. I agree that the first half of Large Band represents some of the very best of Lyle, though it’s rather cynical and removed as compared to the very emotional songs on The Road to Ensenada.